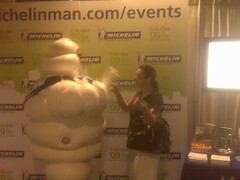 Me and the Michelin Man at Blogher in Chicago! This was a great day, I made tons of connections, met some awesome people, picked up some cool items. Can't wait to go back tomorrow and cannot wait to write about it all on Sunday!